The Miss Universe pageant have crowned its new winner at The AXIS in Planet Hollywood, Las Vegas, Nevada on Sunday, November 26, 2017. Miss Universe 2016 Iris Mittenaere of France passed the crown to Miss South Africa Demi-Leigh Nel-Peters at the end of the event. 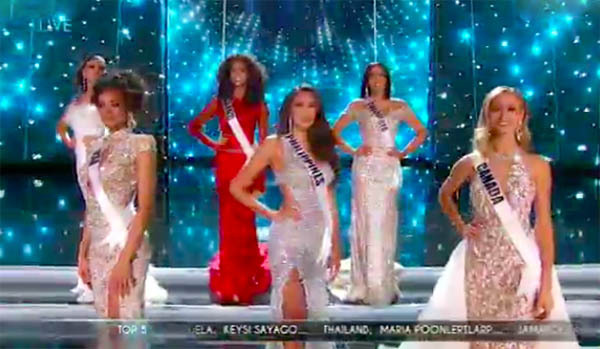 Contestants who made it to the Top 10 finalists are Miss Brazil Monalysa Alcântara, Miss Canada Lauren Howe, Miss Colombia Laura González, Miss Jamaica Davina Bennett, Miss Philippines Rachel Peters, Miss South Africa Demi-Leigh Nel-Peters, Miss Spain Sofía del Prado, Miss Thailand Maria Poonlertlarp, Miss United States Kára McCullough and Miss Venezuela Keysi Sayago. The Top 5 are Miss South Africa, Miss Venezuela, Miss Thailand, Miss Jamaica and Miss Colombia. Did you missed the Miss Universe 2017 Grand Final competition and grand coronation night? Watch the highlights video below, full replay will be added once available online. Watch the full replay video and highlights below. The winner of Miss Universe 2017 will fulfill her duty traveling around the world to represent the Miss Universe Organization and its various causes.